Jhoulys Chacin has been at the top of his game since his last meeting with the Pittsburgh Pirates. 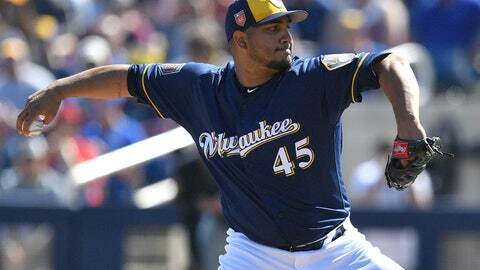 Chacin last faced Pittsburgh on May 5, allowing three hits and one run in six innings, helping the Milwaukee Brewers to a 5-3 win. Since then, he’s been dealing. The veteran right-hander’s shutout win over the Chicago Cubs last week dropped his ERA to just 2.45 since his first May start. Chacin hasn’t allowed more than two earned runs in six of his eight appearances over that span. Milwaukee and Pittsburgh have been headed in opposite directions since that series. The Brewers, then 20-15, were just a game ahead of the 19-16 Pirates following a 9-0 loss May 6 in the series finale. But while the Brewers have held steady and are battling with the Chicago Cubs for the division lead, the Pirates have struggled mightily. Milwaukee’s first-base platoon has been particularly successful. Brewers first basemen rank second in the NL with 20 home runs this season, while the group has the second-highest slugging percentage of any single position group in the league. — Speaking of first basemen, Eric Thames and Jesus Aguilar have thrived when faced with two-strike counts. Thames leads the majors in two-strike at-bats per home run (48/4), while Aguilar ranks sixth (111/7). — The Brewers are 12-3 overall when Chacin pitches. It’s just the fourth time in franchise history that the Brewers have won 12 of a pitcher’s first 15 starts. — Brewers outfielder Lorenzo Cain has been on a tear lately, but has struggled in eight career games against the Pirates. His .212/.235/.242 slash line in those eight games is his worst against a single opponent.